After 5 days in Pai, we decided to take a short trip over and through the mountains to a small town called Mae Hong Son near the border of Myanmar. 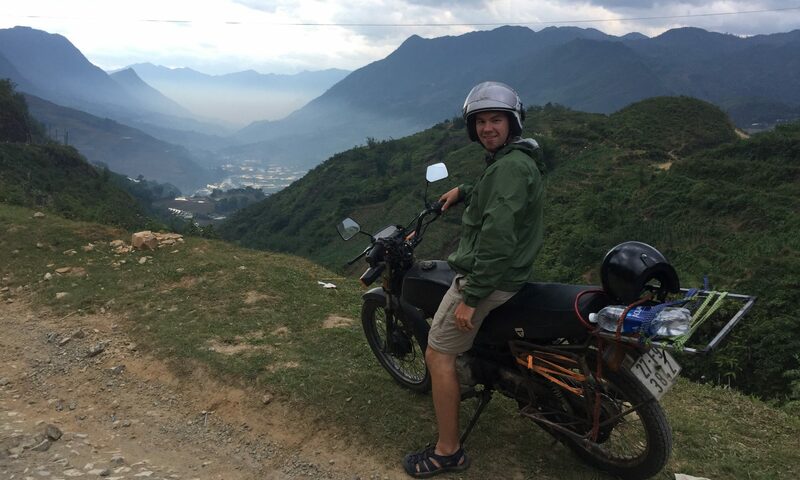 We rented a motorbike and made our way through the beautiful mountains towards Mae Hong Son. We made the drive without any plans arranged. Usually I am all about having a plan set out (with a bit of leeway of course) but for this trip we decided to “just go with it” ( Lucas’s favorite way to travel). We spent three hours driving up and down the winding forest roads. Around each curve and over each mountain top we were rewarded with views for miles and miles. Its amazing how much Thailand’s mountainous terrain reminds us of our Appalachian Mountains back in North Carolina. Think of Appalachian meets tropical paradise and BAM you have Thailand! We have already talked about possible retirement over here, thats how much we have fallen in love with it! Anyway…. as we made our way through multiple checkpoints, passing by small villages and taking a few breaks along the way we finally make it to Mae Hong Son. A small quaint town, with a beautiful lake right in the center. Lucky for us our hotel had a view of that lake with the Wat Jong Klang & Wat Jong Kham Pagodas behind it, it was breathtaking and made our walks at night to the market very rewarding as it too was right on the lake in walking distance to our hotel. The two days we spent in this small town, we ventured off onto the backroads finding hot springs, waterfalls, and enjoying all the beautiful pagodas along the roadways. One of the hot springs we went to was closed for cleaning since it was the off season, but they still had there foot soak hot baths open so we took advantage of that, and as we were fixing to leave the owner stopped us and offered us a discount on their thai full body massage. 130 baht per person ($4 usd) of course we were not going to pass that up so we indulged in our second thai massage and absolutely enjoyed each minute of it. We finished off the day with Pad Thai and thai iced teas 🙂 Feeling spoiled would definitely be an understatement! During our last night there we took a small hike to the temple on the hill (Wat Phrathat Doi Kong Mu) for sunset. Although we did not get a colorful sunset we saw some amazing views of the town from above and got to see a huge storm brewing from afar. The town of Mae Hong Son is not very big, but it still has plenty of attractions to keep you busy for a few days or if your just looking for a quiet getaway it can definitely offer you that as well. On our drive back to Pai, we made a pit stop to visit Mae Lana Cave, Thailands longest navigable cave, unfortunately there was not a tour going out that day because of the rain. But on the road out we stopped at a little cafe that had an amazing lookout so we enjoyed a quick bite, with our feet hanging over the ledge, overlooking where the cave was. A perfect ending to a amazing side trip out of Pai.